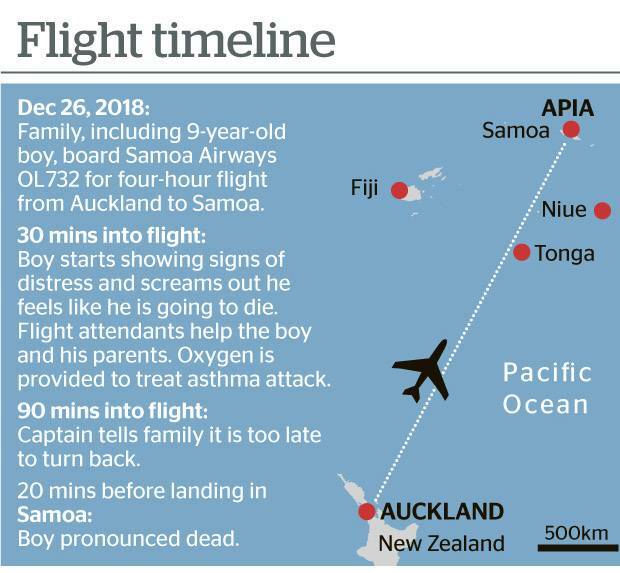 The 9-year-old boy suffered an asthma attack mid-flight from Auckland to Samoa on Boxing Day. Just over three hours later and about 20 minutes before the aircraft landed, the 9-year-old would be dead. Now his family are calling on the airline, Samoa Airways, to reveal what its protocols are when it comes to mid-air emergencies and exactly what warrants an aircraft making an emergency landing or turning back. A woman speaking on behalf of the family told the New Zealand Herald the youngster suffered a severe asthma attack not long into the OL732 Boxing Day journey. "[The boy] screamed out 30 minutes into the flight that he felt like he was going to die. The family say they were told by the pilot about 90 minutes into the journey that it was too late to turn back. Aviation New Zealand Bill MacGregor acknowledged that there were limited places in the Pacific region that an emergency landing could be made. "I don't know what the protocols are for that particular airline, but normally if you've got a major medical emergency and there is a possibility to divert to a place which has a medical facility then you would take that opportunity. MacGregor said each airline had its own protocols, but acknowledged that an emergency landing was very much an option. "It sounds like if you were only 30 minutes out, a return to Auckland would've been on. "Any further on, [it] is a toss-up between Niue and Tonga - they would've been the closest and they're the best part of three hours into it. A pilot for Air New Zealand, who asked to remain anonymous, said inflight medical events were common especially on long haul flights. They then seek advice from MEDLINK, a global response centre for inflight medical assistance and advice, via satellite phone. "They quickly assess the passenger's symptoms, advise the administration of drugs from the onboard physician's kit and recommend whether to land as soon as possible, if required. "We will follow their direction unless flight operational safety prevents so,'' he said. A family service and funeral were held to celebrate the young boy's life last week and he was remembered for being a maths whizz who was excited about his first trip to Samoa. "He was looking forward to this. They were on their way home to attend a big family reunion. He was running around the day before." "He was very intelligent and she said that this was her high achiever. She had high hopes for him. He's gone now."